Oh man, you guys are awesome!! 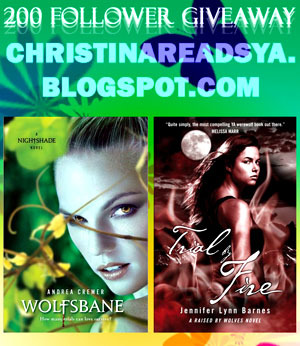 So, just as I promised before, I am giving away my ARC of Wolfsbane by Andrea Cremer and an ARC of Trial by Fire by Jennifer Lynn Barnes. 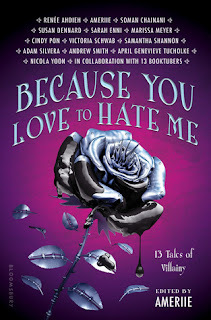 This 200 Follower Giveaway is wolf themed :P.
Wolfsbane (Nightshade #2) by Andrea Cremer [Goodreads, my review] - an absolutely wonderful sequel to Nightshade, and if I hadn't promised that I'd do a giveaway at 200 followers, I would keep my ARC so I could continue to peruse it... and stare at that beautiful old cover. Trial by Fire (A Raised by Wolves Novel) by Jennifer Lynn Barnes [Goodreads, my review] - this one came out already, but if you haven't had the chance to read it, well, here's your chance :P. I hadn't yet read Raised by Wolves when I read Trial by Fire and I still loved this book. -You must be a follower to enter. -Winners will be picked via random.org - 1st chosen gets Wolfsbane, 2nd chosen gets Trial by Fire. Also, if you haven't had a chance to enter my other giveaways, here's my 100 follower celebratory giveaway & my Shadowspell giveaway. Thank you all so much!! Hugs all around :). Hope whoever wins loves these books as much as I do!!! Thank you so much what a great giveaway can't wait to read both!